Barack Obama: First CRM President? Sen. Barack Obama may be the first U.S. president to use CRM technology as a tool to encourage constituent feedback and participation, if his campaign’s efforts along those lines are any indication. Of course, that’s assuming he wins — and his staffers are hoping CRM will help accomplish that feat. Much ink has been spilled about what, exactly, has been the secret of Barack Obama’s overwhelming success. There is no denying his charisma or the appeal of his message, but a behind-the-scenes look at how his political machine operates — namely, how it empowers its people on the ground to operate — is worth a look as well. 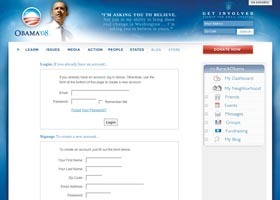 Blogger Bill Ives has written three posts on the way Obama’s campaign uses Web 2.0 technology to improve connections among staff, as well as with voters. In his latest, he looks specifically at Obama’s implementation of RightNow Technologies’ CRM software. The more comprehensive of the RightNow (Nasdaq: RNOW) initiatives, though, is the Obama Answer Center, says Ives. “When you come to the Answer Center the first question is, ‘What is the Answer Center and how does it work?’ The campaign can then adjust the next questions depending on the topics of most interest. For example, when I looked the next question was ‘Has Senator Obama released his tax returns?’ Clicking on this you go to a format used for all questions. This happens to be the standard RightNow template for answer centers so many people remark that they have seen this format before in such places as Environmental Protection Agency, Electronic Arts, and Nikon, [and they] understand it,” he explains. Ives supports Obama politically, he told CRM Buyer, but that is not the reason he is writing about his campaign’s use of technology. “As far as I know,” he commented, “the only other presidential candidate to use CRM technology in the race was Mitt Romney.” However, Romney’s deployment of Salesforce.com (NYSE: CRM) did not match Obama’s outreach to voters and campaign staff, he added. “What is unique is that he is giving his volunteers tools to use themselves,” Ives said. According to Ives, talk on the campaign trail is that should Obama win the presidency he would continue to communicate with constituents through the Web. It would be difficult to match Obama’s level of tech outreach, David E. Johnson, CEO of the political consultancy Strategic Vision, told CRM Buyer. “Obama is doing everything right in the tech world, while Hillary is playing catch up,” he observed. That assessment is not based on Clinton’s ignorance of the wonders of Web 2.0 technologies, Johnson was quick to add. Rather, it is her campaign staff’s failure to recognize they would be running a different race than they are right now. Brent Leary, cofounder and partner of CRM Essentials and author of Brent’s CRM Blog, and Paul Greenberg, author of CRM at the Speed of Light, are crafting a series of videos to talk about “what’s going in the space, what we like, who we like and even who (and what) we don’t like,” Leary writes in his blog. “Yup, we’ll call folks out when we have to. Plus we’ll have the occasional guest on for interrogation purposes. And if you know either of us, you know the opinions won’t be lacking,” he promises. Until then, for those in the industry — both of you — who don’t know Greenberg, you can watch him in “CRM and the Social Customer,” a video developed by social networking platform Neighborhood America. It highlights comments Greenberg and others made at its executive summit in January.